Exhibition “From Aaaaa! to ZZZap!” by the Denny Gallery, 261 Broome Street in New York City, 18 June through 11 July, 2015. Mandiberg echoes a conceptual framework initiated by John F. Simon, Jr. and his “Every Icon” in 1996-97. Every Icon is a grid of 32 x 32 empty squares underpinned by a Java applet that explores successively every combination of black and white squares that could occur within the confines of that grid. Changing from light to dark and back again, the black or white boxes “hop” progressively to the right. Over time (say a trillion years), the grid will will populate itself with shapes. Simon’s algorithmically driven “artist’s proof” speaks to the ephemerality, futility and power of art, which is the unavoidable, underlying theme of “Every Icon” and, for that matter, any instance of installation or performance art. While Every Icon is resolved conceptually, it is unresolvable in practice. the time scales of both evolution and imagination. promise is intricately linked to extraordinary duration and momentary sensation. 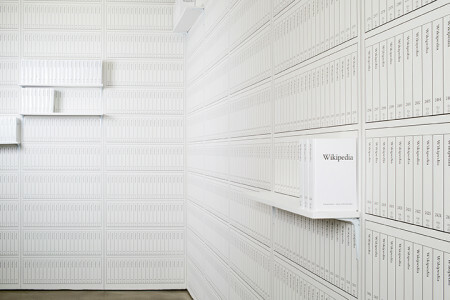 In Mandiberg’s case – whether it is the complete set or a print-on-demand segment – the realized print element of the Print Wikipedia demonstrates the work’s unresolvability in practice. Even if I hold out hope that the “art” (the algorithmic techne/craft) of Print Wikipedia lasts long, any artifact “resolved” by Print Wikipedia will always be out of date until the “final moment” of Wikipedia (whatever that might look like). Warning: the links from previous reviews of Every Icon are often dead, which is doubly ironic: the technical community always speaks of “links resolving to a resource”, so with those dead links, there is a further, unintended “unresolvability”. Mandiberg’s work also echoes the conceptual framework initiated by Paul Soulellis and Library of the Printed Web. Like the volumes in Mandiberg’s Printed Wikipedia, those in the LotPW are created by print on demand. Special Collection (2009), by Benjamin Shaykin. Photo by the Library of the Printed Web. Library of the Printed Web is a collection of works by artists who use screen capture, image grab, site scrape and search query to create printed matter from content found on the web. LotPW includes self-published artists’ books, photo books, texts and other print works gathered around the casual concept of “search, compile and publish“. 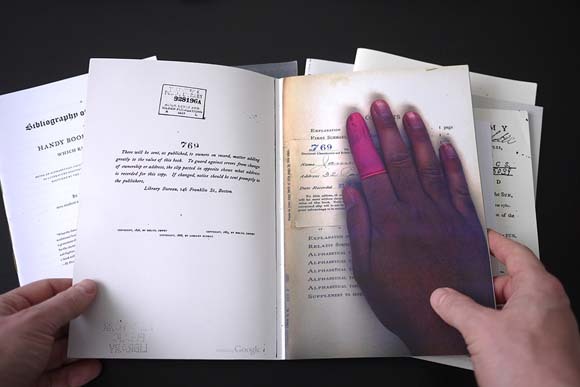 The content in Benjamin Shaykin’s Special Collection consists of found pages in which a scanner’s hand was accidentally captured by the Google scanning system during the Google Book Project . This is truly “manually” found content. The content of Mandiberg’s work is algorithmically “found content” on a massive scale. While it may be that Print Wikipedia represents the “futility of the scale of big data”, I prefer the irrational hope that its print element, however tied to the digital, and the physical book art of the LotPW secure the consolation of “ars longa, vita brevis”. Next Article Bookmark – Iain Pears, Arcadia. The Future of Narrative? The Future of Exposition?